For all those in the Providence area that have ever experienced, or may ever experience a tragedy in the form of flooding, sewage issues, fire events, mold and fungus growths, or any other kind of disaster situation, 911 Restoration Rhode Island is at your service to take care of all your needs. We have teams of dedicated professionals who are all highly trained and IICRC certified to handle any kind of disaster situation that your home or business may encounter. Our teams of skilled and experienced technicians take pride in their ability to be at the scene of a job within 45 minutes of getting the call for help. And we are also available 24/7/365 so that you never have to worry about waiting until the next day to get the ball rolling on fixing whatever kind of problem occurs in your home or store. Our technicians always make sure to put the customer first with every situation we take on, and all the high quality work that we do for every client we have. Our technicians are well-versed in all areas of the restoration industry, and that is why we have become the go-to source for services in all other areas of the country, and now area of Providence and all that surrounds it can benefit from our knowledge as well. In addition to always being there for our customers when they do have a tragedy occur in their property, we are also always here to provide people with advice on how to avoid such instances too. Trim the trees that surround your property so that if there is a major storm, they won’t have any dead limbs or loose ones that might be forced into your roof during severe weather events. Make sure to check the pipes around your property to spot any sections that have been damaged, or are rusted, dripping, or puddling as these need to be replaced immediately. Try to check the hoses and fittings that link up your water-based appliances so that you can spot any wear and tear that may result in a rupture down the road. If your property has gutters, make sure to clean them out at least once a year so that you don’t run the risk of overflows, clogs, and ice dams ruining the protective layers in your roof. Never place anything into a plumbing or septic system that it was not specifically designed to handle with ease. This can include multi-ply varieties of paper and even products that advertise with biodegradability. These are some of the more common ways that people find themselves dealing with disaster situations and how to prevent them, but these are not the only ways to protect your property, so if you have questions, be sure to contact us for more information. 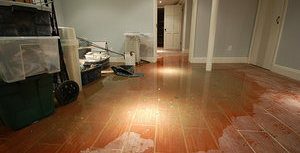 If your property is already amid a flooding scenario of some sort, or if you just want to get more information about how to prevent it, then contact our water damage Providence team with 911 Restoration Rhode Island for help today! 911 Restoration is the best water damage Providence company because we sympathize with the plight of our customers. We understand the dangers and health risks associated with leaks and work hard to resolve them before they can affect our customers. Our team is fully dedicated to professionalism at every turn, and we make sure to walk the customer through every phase of a restoration project. We know how mentally taxing these times can be, and that is why we make sure to always put the customer and their needs as our top priority. Specialists like ours will even help out with all of the insurance papers that needs attention in these situations too. Fundamentally, we truly care about all of the people in this area, and the homes and businesses that they live and work from too. When a frozen pipe burst or rain storms drown your home, call our water damage Providence specialists with 911 Restoration Rhode Island for a fresh start today!